On this fall day, 12-year-old Najee Lee and his classmates are harvesting their garden. Najee and his classmates are among the special education students at Dett Elementary on the city’s Near West Side. His teacher, Kamal Suga, says vegetables aren’t the only things growing in this learning garden. “I think they get a real sense of accomplishment, and it gives them a chance to be a part of the whole school community because they are … interacting with other students here at the school,” Suga said. And while any parent or teacher might have a hard time getting kids to eat their vegetables, Suga says this makes it easier. “We always have a salad option for lunch and just to see a natural part of it, where … the kids could see where the fruits and the vegetables, where they’re coming from,” she said. The garden is a product of a partnership between the school and the nonprofit Kitchen Community. The group builds these learning gardens to be used as outdoor classrooms. Students learn where food comes from and how to grow it. But it’s more than that; the garden gets incorporated into core subjects as well. “They’re learning science, the most commonly taught subject that teachers come out to the garden to address. They’re learning literacy skills, they’re coming out and journaling, using the garden as space to practice writing and reading,” said program manager Sam Koentopp. And sure, there’s planting, watering and harvesting. But the part Koentopp finds most important for young gardeners is: tasting. The Kitchen Community has planted 127 learning gardens throughout Chicago Public Schools, from pre-kindergarten to high school. “The next generation is the generation that is going to be solving our food system challenges, and so this kind of work, this exposure to what this real food is and what it tastes like, is going to create a generation of people who in Chicago, across the country and in all the regions we work in, are really deeply in touch with what real food is, what it tastes like, and why it’s important and help to make those changes to our food system,” Koentopp said. The goal, for now, is to reach 200 gardens–a third of CPS schools– focusing first on schools that can support the use and maintenance of the garden, but also communities where the extra food is needed. So far, the Kitchen Community believes that what they’re doing is working. The organization commissioned a private firm to study the impact of the learning gardens on students and teachers. Their research showed that, compared to students who didn’t use the learning garden, 23 percent of students were more likely to say they eat fruits and veggies in the school cafeteria. And 24 percent were more likely to feel excited about the work in school. Learning garden students were also 6 percent more likely to know where fruits and veggies come from, compared to students who didn’t visit the garden. 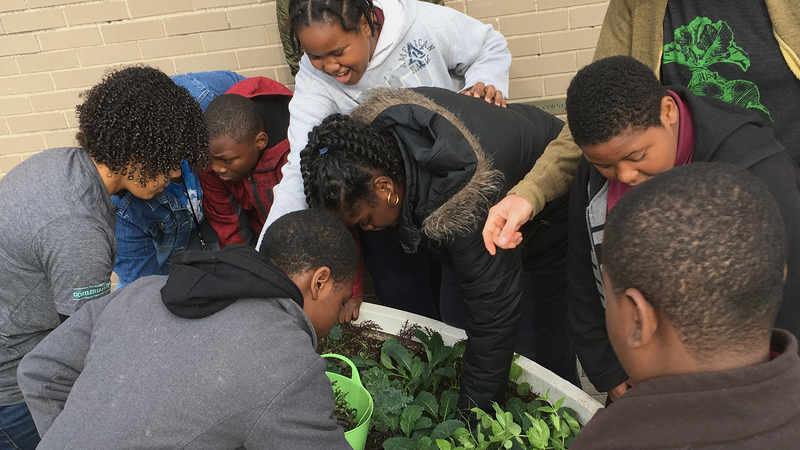 Teachers say it can be hard for fruits and veggies to compete with chips and soda–but this garden is planting the seeds for a better choice. Some students at CPS high schools have turned their learning garden into an entrepreneurial lesson, by selling their harvest to local restaurants. Oct. 26: The Chicago Board of Education on Wednesday voted unanimously in favor of a new districtwide program aimed at getting more elementary school students involved in school athletics. Nov. 1: To get children and teens interested in science, technology and engineering careers, Chicago’s Museum of Science and Industry is planning a new program examining the world around us and the role of humans in it. Oct. 11: Displaced farmers–refugees from other countries–get more than food for their hard work at an urban garden in Chicago's Albany Park neighborhood.